While video game collecting is a popular hobby, video game art collecting is a more rarefied avocation. That’s probably because there are so few pieces to go around. 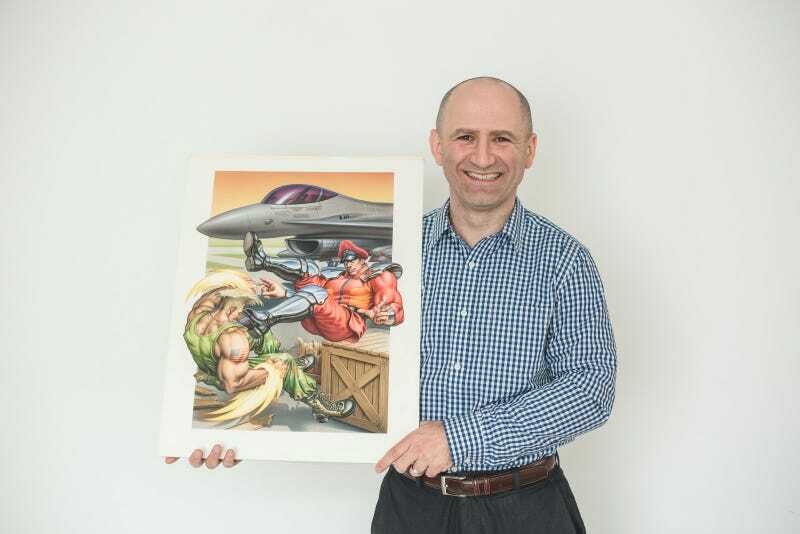 There are thousands of copies of Battletoads In Battlemaniacs for the Super Nintendo, but only one original painting of its box artwork—and that’s owned by Dan, a 42-year-old accountant from Vancouver, British Columbia who’s been hunting down original game art for the last decade. Recently, he posted a massive bounty for one of his holy grails—he’ll pay $100,000 for the original box art used on the NES game Contra. Yep, that’s five zeroes. In an age before high-res digital art and Photoshop, the covers of game boxes were painted by hand and photographed for the box cover. The paintings had to be done larger than the final product, so the original art is usually around 18 by 24 inches, with larger examples going up to about 20 by 30 inches in size. Dan, who asked Kotaku not to use his last name over privacy concerns, began as a garden-variety game collector, at one point amassing a near-complete set of games for the Nintendo Entertainment System that were still sealed in the original shrinkwrap. That all changed, he said, when he bought his first pieces of art. “At the time, it was thirty five hundred bucks or something for three pieces, and I’m sitting there thinking, oh my gosh, what have I done,” he said. “I got them in the mail and my jaw hit the floor. I couldn’t believe the detail, and the color, and just how amazing they looked in person.” Soon, he was selling off the jewels of his game collection to pay for more art. In 2014, he traded his sealed copy of the rare NES game Stadium Events, one of the most desired acquisitions among game collectors and which at the time was probably worth about $30,000, in exchange for the original box painting for the obscure Taito game Panic Restaurant. Ten years later, Dan says his collection includes “more than 50" pieces of original game art paintings, which encompasses not only the art from the front covers of boxes but also original art that was used in advertisements, magazine covers, and for other ancillary purposes. Games for which he owns the original box painting include Blades of Steel, Mechanized Attack, and Ren & Stimpy Time Warp. Most of the challenge of collecting original video game art is just finding out where it is, if it even exists anymore. Today, there’s a little more attention being paid to the artists who created these well-known works: There’s an upcoming documentary about box art that Dan will appear in, and a fellow collector named Adam Harvey will show off his collection of Capcom box art at a retro gaming expo in Ohio later this year. But when Dan and the few other collectors interested in original art started trying to research it in 2008, there was nothing to go on. Dan says he’s spent the last decade diligently running down “as many leads as humanly possible,” and buying as many pieces as he can afford. Often, those leads end in disappointment, finding out for sure that the original artwork was destroyed. As a Konami fan, Dan wanted to track down the box art for the first Castlevania game, but his research led him to two conclusions—one, the box art was created in Japan; two, it was likely destroyed in the Great Hanshin Earthquake of 1995, which took out Konami’s headquarters. What was not destroyed, he found out, was the box art painting to another major Konami game on the NES: Contra. This was because the art used on the box wasn’t created in Japan, but in Europe, by a British artist named Bob Wakelin. Wakelin did art for the publisher Ocean, which had licensed Contra from Konami for release on European computer formats under the title of Gryzor. It’s Wakelin’s Gryzor art (which, infamously, made heavy use of a still of Arnold Schwarzenegger from Predator for the main character’s pose) that ended up on the cover of the U.S. version of Contra. By the time that Dan tracked down Wakelin, he had “long ago” already sold off the original Contra art. Dan reasoned that meant it likely hadn’t been destroyed. But the artist had no idea who he’d sold it to, and the trail ended there.